Share link: 1999details. See also: Basic 1999 GMM city list, 1999 GMM graphics, and 1999 GMM map. 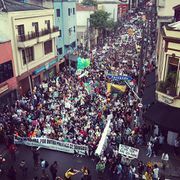 31 cities signed up for the Saturday, May 1, 1999 Global Marijuana March. 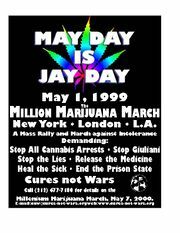 1999 Million Marijuana March posters, flyers, and banners. Atlanta, Georgia, USA. May 1, 1999. Gatewood Galbraith speaking about the petrochemical pharmaceutical military industrial complex. See video . March starts one minute in. 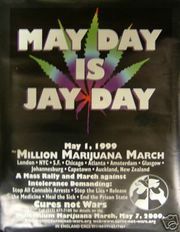 31 cities worldwide for the first international Million Marijuana March on May 1, 1999! 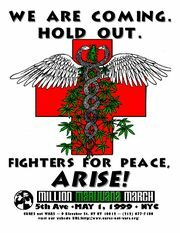 See also: 420 and Global Marijuana March event lists by year. Smoke and Jeers. Million Marijuana March Protests NYC's Record-High Pot Arrests. And: another archive. By Jennifer Gonnerman. The Village Voice. See another archive (partial). Article also mentions Prague, Czech Republic. And Winnipeg, Canada. freedomtoexhale.com/mmm99.htm - Feb 22, 2003 archive and Feb 6, 2012 archive. See index of all archives by date. 1999 MMM article. Another city mentioned: Tel Aviv. cannabisnews.com: International Marijuana Reform Goes To The Web! Google search of CannabisNews.com -- Note that the MMM phrase or the year may be from a comment, and not from the article itself. New York City. 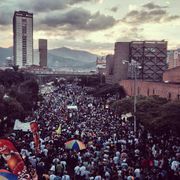 Comments and many photos. Click links for pages 1 through 7 at the bottom of the left column. London and around the world. Rally reports. Seattle, Washington, USA. 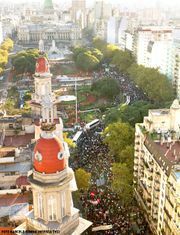 Over the day 4000 people marched and/or rallied. 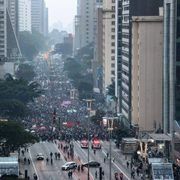 This page was last edited on 10 January 2019, at 14:19.